At the head of North Rollins Street, on the public square in Macon, Missouri, stands the "Dean" of the town's public buildings, the century old courthouse. 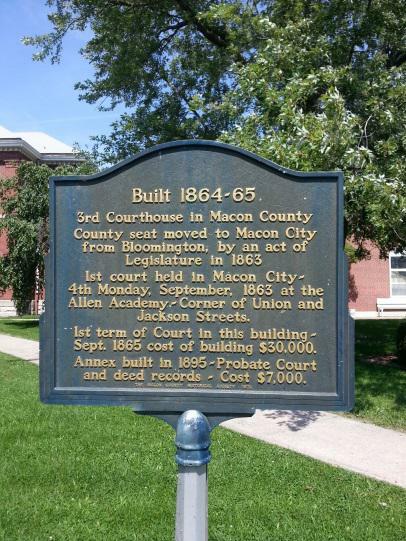 This courthouse was the third for Macon County and it deserves this place of honor for long and continued service to the people of the county. In 1863 Major Thomas Moody was elected to the Legislature and he secured the passage of a bill by an act of Legislature - introduced by the Honorable Abner L. Gilstrap, a representative of Macon County - which removed the county seat from Bloomington to Macon. It took the bill only 48 hours to become law. The result was to be the fatal blow to the already declining community of Bloomington, and the old county seat of the pioneers disappeared with time. 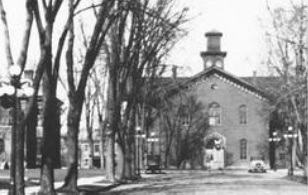 The Circuit Court Record last appeared at Bloomington in January 16, 1863 wherein it was stated that "It is ordered that court adjourn until the fourth Monday of September next." That next term of court adjourned in Macon's Allen Academy on the corner of Jackson and Union, owned by Dr. Frank Allen. The Honorable George H. Burchartt presided; W.T. Oilman was Circuit Clerk and W.H. Holman was Sheriff. The large docket of civil and criminal cases included: action for debts; notes and damages; real estate; partition suits; divorces; suits for attorney fees; naturalization cases; and numerous condemnation suits - necessary for construction of the early railroads. The 25 criminal cases included: murder case prosecution; robbery; grand larceny; gambling; liquor sales and other misdemeanors. During the Civil War, soldiers took possession of the Academy and court was held in the little school house near the Towner Tobacco Factory southwest of the City Park. It met there until the first term of court in September 1865, when it adjourned in the handsome new courthouse on Rollins Street. Uncle Burton Edwards must have been in tune with these lines from Longfellow, "Build today, then strong and sure with a firm and ample base; and ascending and secure shall tomorrow find its place" when he began to fashion this grand old structure. The 'firm and ample base' was native rock hauled from Coal Hollow, south of the old City Cemetery that is now Woodlawn. 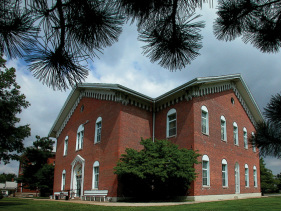 This elegant, two story building, built in the distinctive style of the Civil War period, with its high curved windows and scalloped trim, its fenestration and ornate cornice design repeated above the recessed south door and accented in white against the red native brick, blend together to fulfill the lines of the poet, for it is indeed secure in the hearts of the people of Macon County. The building was designed by Levi Aldrich. After the Civil War Macon began to prosper, growing rapidly into a busy thriving community with public buildings equal to those in other towns much older. On the first floor were the county offices. The second floor had one of the most spacious and commodious court rooms to be found at that time. It is said that no circuit court room in the State of Missouri has finer acoustic properties than those found in the Macon County Courthouse. In the early 1930's the security of this building was threatened by those who envisioned a new modern building, which could have become a reality with ready government funds. It was a close escape, but the courthouse's many friends saved it from destruction so the $15,000 in Federal funds was instead allocated to redecorate, lay new floors, install new seats and make other improvements to the existing building. At this time the circular staircase on each side of the lobby was removed and replaced with a straight stairway that was built on the south side, west of the front entrance. The court room was also refurbished and the picturesque old cupola and shutters were removed. the counter in the tax collector's office. In the summer of 1971 the exterior of the courthouse and annex had a face lift. The brick was painted a deep red and the ornate trim was white again. In 1976 it was the wish of the Macon County Historical Society to replace the cupola and the shutters, so that it would be restored to its original distinctive beauty once again. In 1974 the first floor was completely redone. The walls were paneled, woodwork painted, ceilings lowered, floors carpeted and air-conditioning installed. The Judge's bench was restored to its original appearance. Despite the fact that this charming, historic structure was the result of a Union General's determination to destroy a rebel town, it still stands beautiful and strong to this day - well into its second century - with a dignity that only age can bring, as one of Macon County's most precious and honored landmarks. Surely no other building in the county is more secure in the affection of the people of Macon than that red and white structure at the head of Rollins Street - The Macon County Courthouse.